"After a horrible accident claims the lives of her family, sixteen-year-old Ever Bloom can see people's auras, hear their thoughts, and know someone's entire life story by touching them. Going out of her way to avoid human contact and suppress her abilities, she has been branded a freak at her new high school-but everything changes when she meets Damen Auguste. This book has been sitting on my TBR shelf since it came out in paperback. I had picked it up because I liked the cover and the premise seemed good. Somehow it just kept getting pushed off the top of the pile. The book was interesting. It kept me reading because I was quite sure what was going on, about half of the way through I was still wondering who was who. I kept checking the cover to make sure it said the Immortals and not the Vampires. Alyson Noel does have the characters joke about that a little in the book themselves. 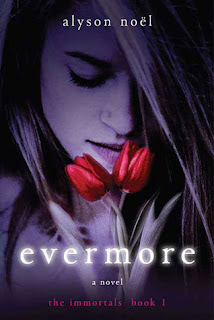 Evermore was like a mystery novel figuring out why Ever is the way she is and why Damen is the way he is. It does have a lot of similarities of some of the other popular YA novels that came out around that time. I really liked Ever in the beginning. She was going through a lot but she still had a sense of strength about her. I liked that she didn't cave to Damon easily and would even take control of the situation at times. Towards the end of the book I felt she digressed a little bit, she seemed to get more sappy and selfish. Where was that strong girl I enjoyed in the beginning of the book. Even though she hid under a hoodie she didn't seem like she was going to take anyones crap. Damen was mysterious and seemed totally devoted to Ever. I don't think it was ever really explained why he could silence her thoughts. There are five more books to explore just that I'm assuming. Drina was good as the villian and when her and Damen's true relationship comes to light. I found that perspective unique. She wasn't just following Damen around for no reason. I also liked her influence on some of the supporting characters, it made her seem more clever. The writing flowed and I actually finished the book quickly. I had to know what the mystery was! So as far as keeping me engaged it did a good job with that. I'm not going to pretend I would consider it my favorite book ever but it is definitely an interesting read. If you like paranormal romance, this definitely falls in line with that.